One size fits most men with an inner elastic adjustable tie, fitting up to XL. Brim measures 2.5 inches wide. Classic stingy, trilby fedora hat for gentlemen. 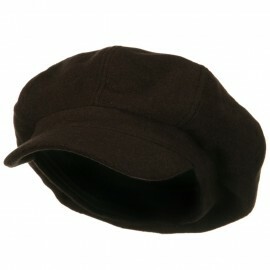 A black grosgrain hat band is accented around the crown. A feather is accented on one side. Edge of brim is trimmed in black. Our homburg hat is great for walks in the park, trip, date, wedding as well for formal outings. 12(W) X 12(L) X 5(H)inches.